I am still surprised by the number of people I meet you do not have a Linkedin profile. I meet these people often for the first time when doing a preliminary interview for a role, and it is one of the first things I tell them to do. No matter what you personally think of Linkedin, it is a truth universally acknowledged that all recruiters and most employers use Linkedin as a recruiting tool, and if you are serious about your career you will need to have a Linkedin profile, and use it effectively. Make sure you have a professional looking profile photo. Don’t use glamour shots, photos where you can see someone has been cropped out, or a photo of yourself in a social situation. The photo should be simple, clear, and professional. It doesn’t have to be a mug shot, though! Did you know that if you have a professional photo you are 14 times more likely to be found on Linkedin? Enhance your personal brand by creating a custom URL for your Linkedin public profile. Edit the Linkedin URL automatically created to shorten it to your own name – this will ensure your name is one that comes up first in any search for someone with your name. If your name is already taken, add a ‘1’ to the end of it. ALWAYS add a personal message when connecting with people – for example ‘Dear Bronwyn, it was lovely to meet you at the xyz event. I’d like to add you to my professional network on Linkedin’. Your headline is what you DO, not where you WORK. Your summary should be written in the first person, not as if someone else is writing about you. Follow organisations that interest you (hot tip – other law firms publish content that may be educational). Join groups in your area of interests. Publish content – whether your own, or shared content from other Linkedin members, thought leaders, or published articles. Most people spend approximately 17 minutes per month on Linkedin, with 13% of people using it on a daily basis. 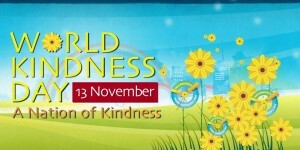 Today is world kindness day. This day is celebrated as it is the anniversary of the opening day of the first World Kindness Movement ® conference, held in Tokyo in 1998. Isn’t it a shame that we have to have a day dedicated to kindness, in a world where we are all rushing from one thing to another. It is easy to forget the simple things that make for a happy workplace. One of these things is the simple act of kindness to others. Think about those nine words. It is such a simple statement – not just the number of words but also the truth of those words. When we show kindness to others, we invariably receive a ‘thank you’ in return. The impact on our mood in giving the gift of kindness, and receiving gratitude, is immeasurable, although scientists and psychologists are doing their best to measure it. Recent studies have shown that kindness is contagious – and this Huffington post article explains a little about that. Plus it has a bonus scene from my all-time favourite Christmas movie ‘It’s a Wonderful Life’. So if kindness is contagious, imagine if all people in the office decided to practice a random act of kindness for a colleague every single day – what an amazing workplace that would be. There are many ways you can practice kindness to your colleagues, and not all of them take time or effort. The simple act of holding the lift as the doors are closing, for someone rushing to catch it, is an act of kindness. As is opening the door for someone carrying a heap of heavy files. Carla Thomas – By remembering what they like and showing an interest in their interests. Ashton Bradley – Asking how people are, holding open doors, leaving communal areas tidy & smiling. Shae Sivyer – Smiling, compassion & showing them you care. Caitlin Chapman – By always greeting and saying goodbye to each colleague genuinely and instigating a conversation on how the person’s day is or how their night was. Davina Wenzlick – A smile and a word of kindness. Shonnea Nicol – Always treat people the way you want to be treated. Karen Waldock – Do unto others as you would like them to do to you. How are you going to show your colleagues kindness today? In a perfect world, your supervisor will be someone who gives clear instructions, as well as their expectations and timelines. In reality, supervisors are very busy people and often have something that needs to be done quickly, and don’t always articulate what they need from you. They are under pressure from clients and other practitioners. So here is a guide to make sure your supervisor gets the best out of you. Ask for background information – knowing the bigger picture can put the task into context. Be clear about the end product and effort required. There is no point in preparing a four page memo when your supervisor wanted a 5 dot point summary or a verbal report. Clarify your authority – are you able to call the client, for example? Identify useful resources – is there a precedent available, or a similar file someone else has conducted? Reinventing the wheel is a waste of time. Summarise your understanding of what you are being asked to do – repeat back your instructions to make sure you have not misunderstood. This will save a lot of time should the instructions not have been clear. Touch base if necessary to make sure you are on the right track for complicated or lengthy tasks. Set aside time – your supervisors are busy people. If it is not urgent, make a time that is convenient for them. And use their time efficiently. But – seek assistance promptly if you are in trouble. Don’t leave it to the last minute, with a deadline approaching to tell someone you are struggling. Ask for feedback after the event. How wonderful if your research was copied and pasted into a letter of advice. If it was changed, what could you have done differently? Take constructive feedback on board – don’t avoid it or become defensive. If you have multiple supervisors, discuss & clarify which urgent matter has to take priority prior to commencing any of them. Remember – this is your career, and it is your responsibility to take control of it and make sure you develop and grow with the help of your supervisors. If you work with them in a way that makes their life easier, they will come to depend on you. And that is a good place to be.